Chroma 17000 series is specifically designed for the formation of Lithium Ion and Lithium Polymer secondary batteries. 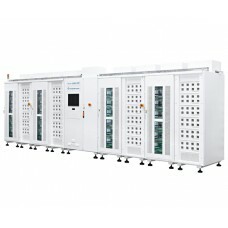 The 17000 series is a complete turn-key system, including carrier trays, robust battery probe contacts, high quality charge/discharge modules and intuitive software all under computer control. 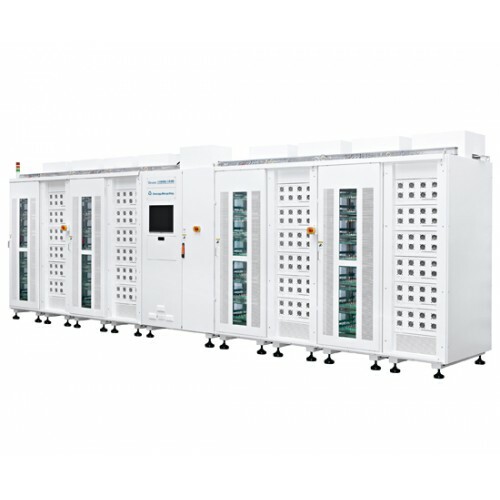 Patented Battery Voltage Tracking (BVT) DC-DC conversion power modules minimize power consumption in battery charging, and Energy Recycle Modules (ERM) recycle the discharged energy directly back to the DC power system for increased power efficiency. These power saving designs provide a planet friendly solution along with cost savings by reducing energy consumption. The intuitive software provides a flexible selection in the charge/ discharge channel, current rating, and modules under test. These features allow the Series 17000 to be used for final cell development, pilot line production, high volume production and ongoing reliability monitoring/quality control.